Bottled water consumption and sales have been increasing exponentially since its emergence as a widely-accepted commercial beverage category. The bottled water industry is now growing at 8% to 10% annually – about twice as fast as other beverages. In fact, in 2003 bottled water became the second largest commercial beverage category by volume in the United States, surpassing milk, coffee, beer, and is now second only to carbonated soft drinks. In 2003, Nestle Waters of North America (NWNA), Coca-Cola, and Pepsi where the top 3 bottled water companies in the US. These top 3 companies accounted for 59% of the total wholesale dollar sales. Pepsi’s Aquafina was the top-selling brand in 2003 with sales of $936 million. In addition, NWNA has 3 of the top 5 bottled water selling brands: Poland Spring, Arrowhead, and Deer Park. To further gain markets, trends in bottled water include new product development, wide spread marketing and packaging efforts, and the emergence of new industries tapping into bottled water. While most all trends positively affect the bottled water industry, an increase in consumer knowledge about bottled water origins and tap water safety may emerge to momentarily halt or at least deter rapid industry growth. The most conspicuous trend in the bottled water industry is the development and flooding of a seemingly never ending array of bottled water products. Among them are: bottled mineral water, spring water, sparkling water, artesian well water, purified water, distilled water, fluoridated water, calcium enhanced water, hyper-caffeinated water, protein enhanced water, vitamin infused water, mint flavored water, fruit-flavored water, hydrating water, and now even super oxygenated water and “cosmeceutical water.” One Australian company even extracts water from apples and oranges by freezing fruit juice and using a “pressure chilling” process to separate the fruit from the water. Other manufacturers seek to carve out a new level in the bottled water industry introducing high-end products. These bottlers seek distinction by marketing their water origins, fortification, or even bottled shape, size and styles. Examples of these include: bottled water that now comes in bullet shaped glass, icicle-shaped plastic, see through labels, sports ball-sized water bottles, and the ever-changing unique cylindrical containers. Targeting your niche audience (market) also applies to the bottled water industry. For instance, based on the statistic that only 17% of lunchboxes taken to school have water and the fact that many schools have now banished soda, some bottled water companies are trying to appeal specifically to children (and ultimately to parents). What’s their approach? One company launched a Looney Tunes Category of bottled water, introduced “two-piece sports caps,” and a “belongs to label” to personalize bottled water. Another company plans on introducing “aquapod spring water” and flood Nickelodeon and other popular kids’ channels with animated ads. Another packaging trend in the bottled water industry is multi-packs. As current bottled water consumption grows, more consumers are turning to multi-packs to save time and money. In fact, multi-packs, according to ACNielsen, now account for 15% of total c-store (convenience store) bottled water volume. This gives consumers more value and it gives retailers larger volume and revenue potential. Recent media, including ABC’s 20/20 report: “Is Bottled Water Better than Tap?”7and The National Resource Defense Council’: “Bottled Water: Pure Drink or Pure Hype?”8 (March 1999 petition to the FDA and results of a four-year study on the bottled water industry) and PBS’ P.O.V. Borders: Environment9 segments on bottled water have all spurred an ongoing debate questioning the origins of bottled water, tap water’s safety, misleading labeling practices, and regulatory gaps in the industry. Even though more than half of all Americans (54%) drink bottled water, and about 36% imbibe regularly (more than once a week),11 several consumer demographic trends have emerged. 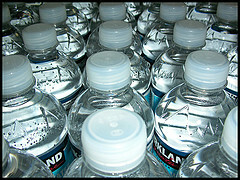 Studies suggest that Americans with income of $60,000 or more are 35% more likely to purchase bottled water. However, even though Black, Hispanic, and Asian household’ income are generally less than average, these groups are more likely to purchase bottled water. Also, according to American Demographics, women constitute the majority of bottled water drinkers. Some 45% of 18 to 34 year old women and 44.6% of 35 to 54 year old women consume bottled water. Men’s percentages of the same age groups (18-34) drank 35.3% and those in the age group from 35 to 54 consumed 34.5%.12 In addition, according to WQA surveys, some 47% of 18 to 34 year olds do not think that their water is safe; therefore 41.4% of them consume bottled water regularly. Other demographics relative to the consumption of bottled water are those of the older and younger generations of Americans. Due to the older generations’ matured tastes, they seek more natural, less caloric beverages. Younger Americans who are increasingly active and have literally grown up with bottled water are beginning to understand the importance of drinking water for better health and overall wellness. Residents of Los Angeles (3.2 servings) and San Diego (3.2 servings) drink the most bottled water during the course of an average day. These demographics clearly indicate that from young to the not so young, from men to women, and from coast to coast, bottled water is conspicuously consumed in the United States. Combine this with current trends, the vast array of augmenting bottled water categories, astoundingly large consumer demand and wide-spread marketing practices, the outcome is that the second largest commercial beverage category in the US today is bottled water. 1United States – Bottled Water. Datamonitor Industry Market Research. 2 “Bottled Water: More than Just a Story about Sales Growth.” International Bottled Water Association, April 13, 2006. 7 “Is Bottled Water Better than Tap?” ABC News 20/20 Report: May 6, 2005.